The Salisbury and Yeovil Railway (S&YR) opened the final part of its line from Sherborne on 1 June 1860. It crossed over the Wilts, Somerset and Weymouth Railway (SW&WR) line of the Great Western Railway (GWR) on a bridge close to Bradford Abbas, then ran alongside it and the Yeovil branch line of the Bristol and Exeter Railway (B&ER) to reach that company’s terminus at Hendford, on the west side of Yeovil. Just a few weeks later, on 19 July, the London and South Western Railway (L&SWR) opened its Yeovil and Exeter line. This left the S&YR at Bradford Abbas Junction and crossed over the GWR line to its own station at Yeovil Junction, and then continued on towards Exeter Queen Street. 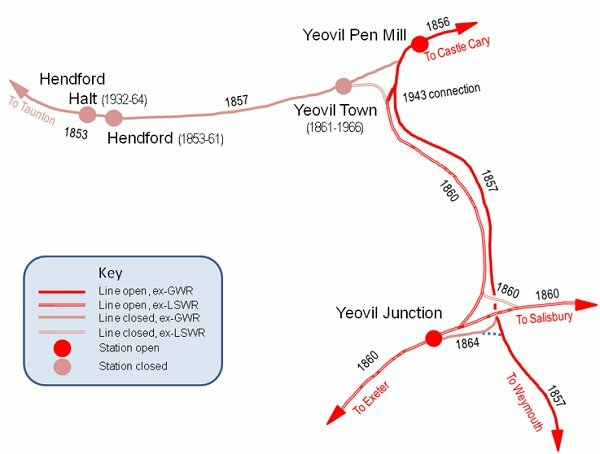 The station was a junction because another line led back to join the S&YR at River Junction, so trains could run from Exeter direct to Hendford although the terminus was moved to a joint B&ER/L&SWR Yeovil Town railway station from 1 June 1861. 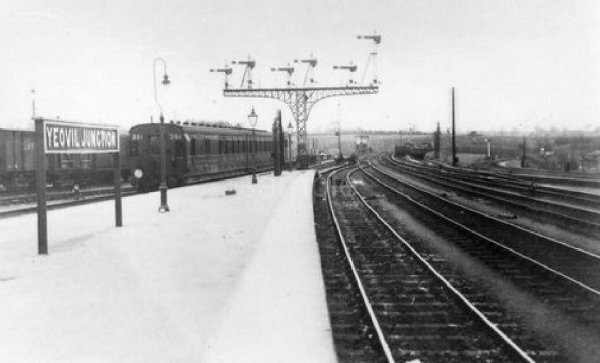 The original eastwards connection from River Junction to Bradford Abbas was closed in 1870, after which most main line trains only called at Yeovil Junction where passengers could change onto a connecting train for the short journey to Yeovil Town. The L&SWR operated all trains over the S&YR and bought the smaller company in 1878. The first turf of the South-Western Central Line was turned on the 3rd instant, at Gillingham, under the most encouraging auspices. Notwithstanding the heavy rain, which began at an early hour and continued without the slightest intermission all day, the town of Gillingham saw a very great influx of visitors on the occasion. The turf was turned in a field belonging to Mr Kaines, situated at a convenient distance from the town of Gillingham. At the entrance a substantial triumphal arch had been erected, above which floated the the national colours of England, France, Sardinia and Turkey. The ceremony of turning the first turf was performed by Miss Seymour, sister of the hon. member for Poole, the Chairman of the Company. 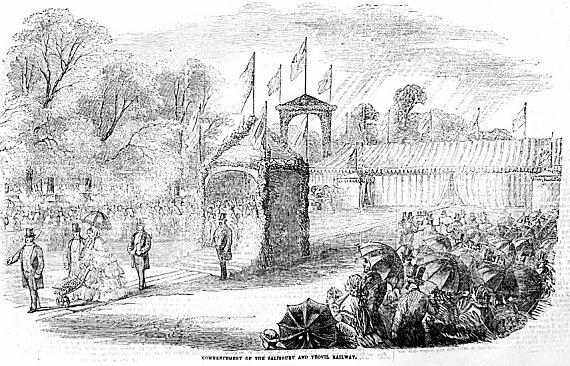 A very elegant barrow and spade were prepared for the occasion, by Mr Burt, CE. The barrow is formed of walnut; the shafts terminating in griffins' heads, and the spokes are fashioned as sheaves of corn. It bears the arms of the South-Western Company, the Salisbury and Yeovil Company, the Seymour family, of Mr Locke, and of the contractor; and the sides are of silver lattice-work. The spade, of solid silver, is beautifully engraved and ornamented, displaying the arms of the South-Western and the Salisbury and Yeovil Railway Companies on one side and on the other an inscription stating that it was presented to the Hon. Miss Seymour. The station at this time had two platforms serving three tracks. 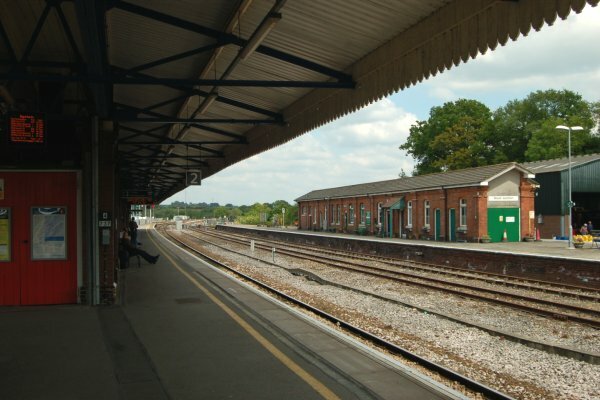 The northern side was the track for trains to Salisbury and London Waterloo; the middle track was covered by a train shed and could be used from either platform and was for the trains to Yeovil Town; the southern track was for trains to Exeter. Goods traffic was handled on the north side of the main line, and a turntable was placed on the south side. On 13 June 1864 a new line was opened from the GWR up to a goods station at Clifton Maybank on the south side of the L&SWR station. The GWR was, until 1874, a 7 ft 1⁄4 in (2,140 mm) broad gauge line and broad and standard gauge wagons could be brought alongside each other at Clifton Maybank to allow goods to be passed between them. 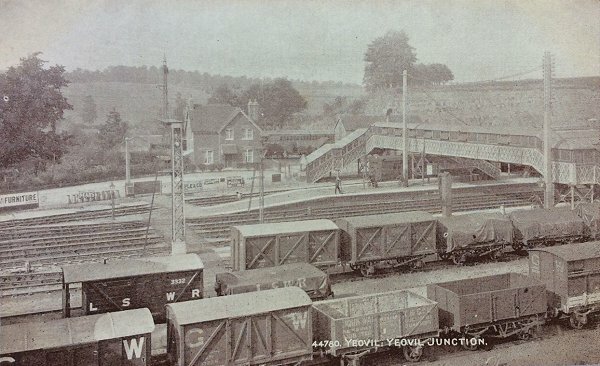 Yeovil Junction, looking north and photographed in 1918. 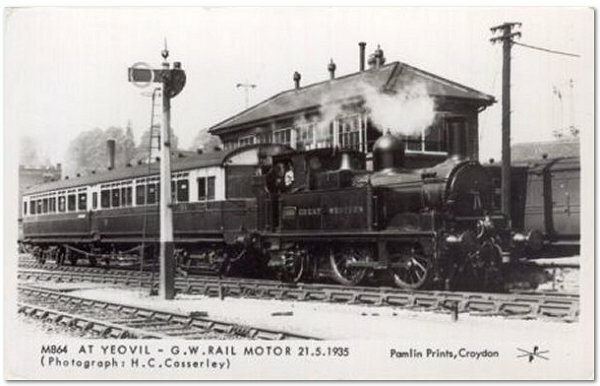 A 1980's postcard featuring a 1935 photograph of a GWR locomotive at Yeovil Junction. 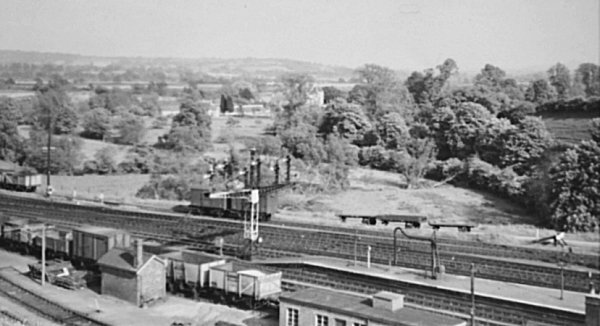 The view from Yeovil Junction, looking west, photographed about 1938. 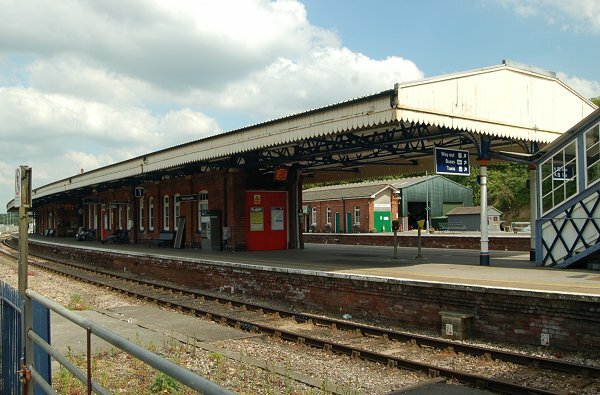 The signal gantry and end of the platforms at Yeovil Junction. Photographed 1961. 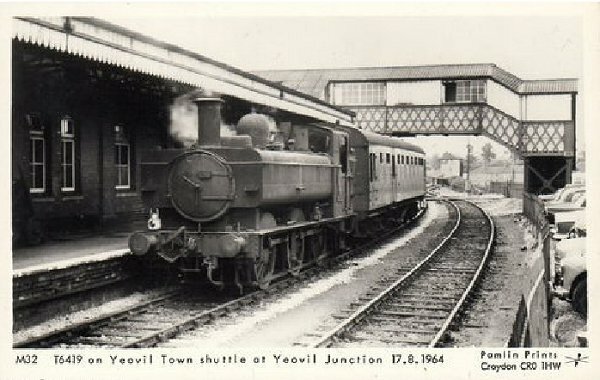 A 1980s postcard of a 1964 photograph of Yeovil Junction featuring the footbridge and the Yeovil Town shuttle service. 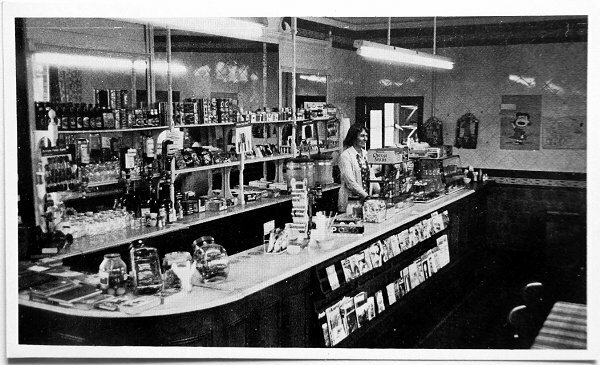 A 1978 postcard of the buffet at Yeovil Junction. Yeovil Junction station platform 1 seen from the bottom of the footbridge. Photographed in 2014. Yeovil Junction station platform 2. Photographed in 2014.